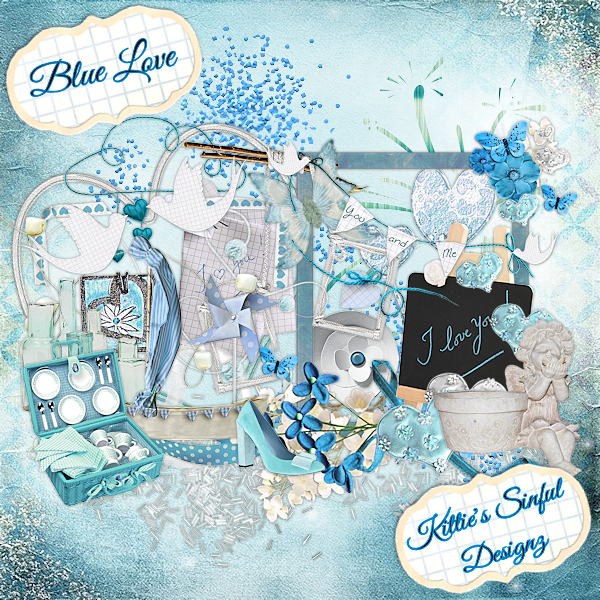 My latest kit "Blue Love"
Are you in love? Do you love blue? Well then this is the kit for you... Blue Love is a magical love kit with splashes of blues. This is the perfect kit for all your love projects. This kit can be used for a number of things like Valentine's day projects, love, winter, blue creations, Christmas, facebook banners, signature tags, invitations, baby boy etc. This kit is packed with 108 elements and 12 papers 300 dpi. Papers are 3600x3600 (full size) and 800x800 (tagger size) pixels and saved in JPEG format. All elements and papers are not shown in preview.